At Experience Wellness Chiropractic, our patient-centered approach involves chiropractic care given with a more delicate touch. Plymouth chiropractors Dr. Jeremy Faue, Dr. Brenna Highby, and Dr. Allison Gamoke see all ages and stages, including pregnant women, children, athletes, and seniors. Your chiropractic care is gentle, effective and tailored to what you need. We have the softer techniques required to provide care to even the youngest of patients. In fact, babies usually sleep right through their adjustments! It is amazing how effective a light force adjustment can be when it is applied specifically to remove interference to the nervous system. 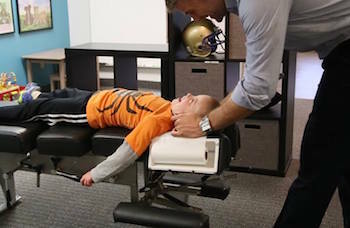 The doctors at Experience Wellness Chiropractic have trained extensively with the developer of Talsky Tonal Chiropractic, Dr. Marvin Talsky, in order to bring this amazing technique to our community. This is truly a “Nerve First” approach as it looks specifically to address spinal cord tension (subluxation) and the detrimental effects that it can have on your health. Using this technique, the adjustments can be applied by hand with a light force contact, or by using an instrument with a specific impulse – both of which have amazing results in releasing the tension from the nervous system and allowing complete relaxation and healing to occur. Every visit you make to Experience Wellness Chiropractic will start with a pre-check to make sure that your body truly needs to be adjusted, and after each contact is made you will have a post check to make sure the adjustment was effective in reducing the spinal cord tension in your system. The old days of twisting and popping one vertebra after another are gone, because your family deserves better. We are dedicated to making sure you and your family receive the most advanced care in chiropractic today. Webster Technique helps release stress on the pelvis, relaxing surrounding ligaments and reducing the sacral subluxation to help restore more normal function. Sacral subluxations may cause the tightening and twisting of pelvic muscles and ligaments, constraining the uterus. The goal of the adjustment is to reduce the effects of subluxation and the associated dysfunction of the sacroiliac joint. The result? Neurobiomechanical function in the sacral/pelvic region is improved, benefiting pregnant mothers or others with sacral subluxations. X-rays are located on-site, and convenient Saturday appointments are available.